But here’s the truth: That’s not love. Love doesn’t just happen to you. Love is a choice, and it represents a commitment. “Love the LORD your God, listen to his voice, and hold fast to him. 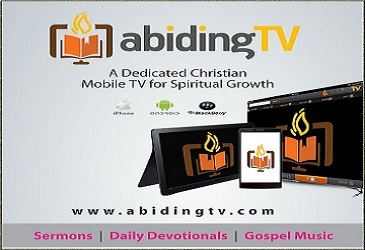 For the LORD is your life, and he will give you many years in the land he swore to give to your fathers, Abraham, Isaac and Jacob” (Deuteronomy 30:20 NIV). Too many people have bought into the myth that love is uncontrollable, that it’s something that just happens to us. In fact, even the language we use implies the uncontrollability of love. We say, “I fell in love,” as if love were some kind of a ditch. I’m walking along one day and—bam!—I fell in love. I couldn’t help myself. There’s no doubt that attraction is uncontrollable and arousal is uncontrollable. But attraction and arousal are not love. They can lead to love, but they are not love. Love is a choice. 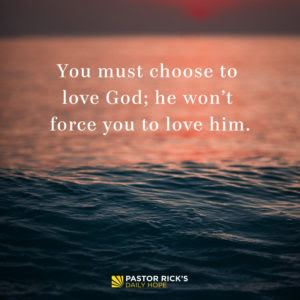 You must choose to love God; he won’t force you to love him (Deuteronomy 30:20). You can thumb your nose at God and go a totally different way. You can destroy your life if you choose to do that. God still won’t force you to love him, because he knows love can’t be forced. This same principle is true about your relationships: You can choose to love others, but God won’t force you to love anyone. How is love received differently when you understand that it is a choice? How would you explain the difference between love that is from God and love that is based on human understanding? What people in your life have demonstrated the truth that love is a choice and a commitment?